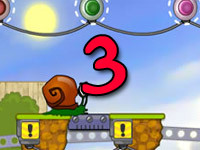 Level 1: Just lead Bob the Snail on to the lever looking thing and let it push him up to the exit. Level passed. 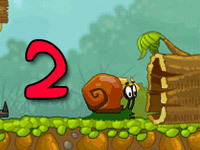 Level 2: You have to lead Bob to the button on the top near the tunnel and click Bob the snail to stop him. You do that because you want the brown stump to roll down and once it does, click on Bob again to get him going again and let Bob roll down the moving machinery towards the exit. 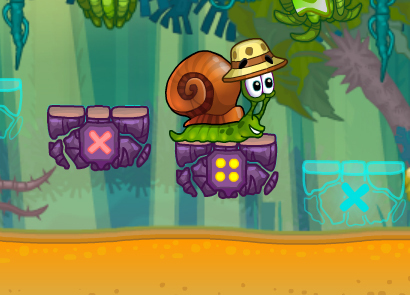 CLICK HERE TO PLAY SNAIL BOB ! Side note: If you want to control Bob’s speed, all you have to do is press 1 or 2 on the key pad. Or you could do it from the screen at the top left hand side of the screen where it says “x1” or “x2” in the two circles. Level 3: Coming out of the tunnel, click on the rotator and drag it upwards with the mouse key so the bar comes upwards and from there just go by stack of boxes to turn Bob back around and this time, the bar goes down pushing bob towards his exit on to level 4. 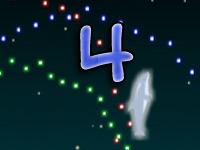 Level 4: This one is really simple, just drag the level where it says drag (to the right) and then Bob gets on a rotating wheel, let him get on there while turning the rotating knob at the top of the screen allowing the ball to drop and it drops him off right to where the exit is at. Just move him towards the exit. Level 5: Bob drops into a wagon, hold the mouse key where it says “hold”, and pull bar at the top of the screen, allowing Bob to drop in the tiny area allowing the wagon to push him to the exit. Level 6: Rotate where it says rotate allowing the ball to drop and Bob comes right to the exit. 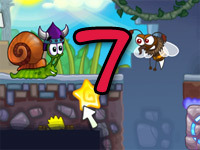 Level 7: Go towards the exit, stand Bob on the red button, and go back the other way moving down and then Bob falls onto the spinning rotator towards the silver bar, drag by the arrows and Bob is pushed up by the silver bar to his exit. 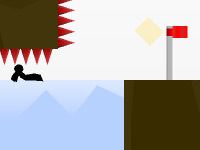 Level 8: Drag where it says drag at the bottom of the left hand side of the screen, As Bob is walking, push the lever to the right, then push the lever to the left again when Bob is on the springboard allowing Bob to springboard to the exit. Level 9: Click purple first at the top where the colors are, then click red, click green and then click blue allowing Bob to get to the exit. Level 10: Click lever at top pushing it down, then push battery to the charger thrusting you to the exit. 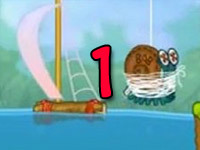 Level 11: Drag the thing that says drag and keep it over Bob’s head all the way up until the exit. It acts like an umbrella so to speak. Level 12: click on the arrow, it moves with Bob and you have to keep clicking it to try and keep at least a step up before keep the bar under Bob at all times while he gets to the exit. Level 13: Click on the first red dot then the second red dot, and then click on the left arrow at the top of the screen and then the right arrow to get him to the exit. 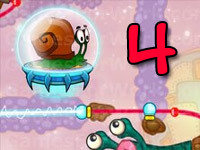 Level 14: In the middle of the screen, right lever, left lever, right lever, left lever and then the right lever to push him all the way up to the exit. Level 15: Rotate lever sending a box down, then press lever down at the bottom of the screen, then quickly back up and it sends Bob to his exit. 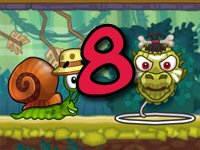 Level 16: Don’t press on Bob, far left arrow, then left arrow, where it says drag at the far right hand side of the screen, move it to the left, drag at the left of the screen up and down, putting Bob in a moving basket to the exit. Level 17: Rotate Lever, rotate to the right some more to put out the fire, and stop Bob for a quick second until the fire goes out and send him to exit. Level 18: Press the top lever upwards, then press the first orange charger up, the second one down, then back up once Bob passes it, then click on button below rotator spinner and clicking on the second orange charger again sending Bob up to his exit. 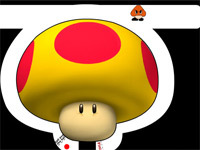 Level 19: click on right arrow on screen, then left screen arrow, then red button which sends Bob going down, and then press right arrow again, then press bottom red button on left side of the screen and then top red button above it to send him to the exit. Level 20: press second red button to send Jack back to the initial side he came out of, press top red button to send a battery coming down, push battery down to the charger, then turn the lever, while pressing the top red button and it sends a green charge battery down, push the green one to the green side and then press the red button that is by it and then press the red button that is by the red one, press middle red button by “x” sending Bob up to his exit and finding his new house.